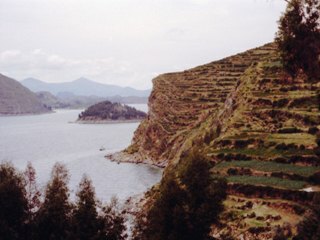 (upper left) Isla del Sol (Island of the sun)" on Lake Titicaca. 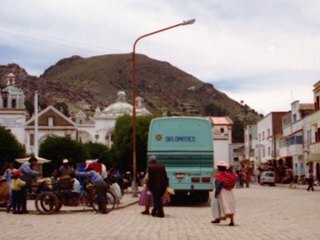 (upper right) Copacabala, the border town at Bolivian side. (upper left) Ciudad del Este (City of the East), the border city at Paraguayan Side. (upper right) Itaipu Dam, the largest dam in Latin America. (upper left) Crossing the border bridge on Parana River from Encarnacion, Paraguay. (upper right) Immigration in Posadas, Argentina.